QUẢNG NAM — The central province, in co-operation with the Centre of Biodiversity Conservation, GreenViet, began an urgent conservation project for two herds of gray-shanked douc langurs (pygathrix cinerea) in a forest of Núi Thành District’s Tam Mỹ Tây Commune. 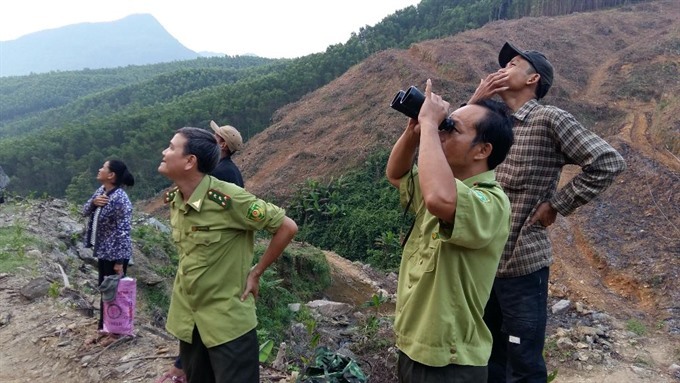 Deputy head of Quảng Nam Forest Protection sub-department Từ Văn Khánh said the population of 20 gray-shanked douc langurs were found living on 10ha of primary forest in 2000, and the local community have since protected the critically endangered primates. Khánh said the langurs, listed on the International Union for Conservation of Nature (IUNC) Red List as one of the world’s 25 Most Critically Endangered primates in the world, and only found living in Việt Nam, faced being wiped out when an acacia log farm began expanding in the area. He said the endangered langurs were found living in a forest in Nông Sơn District of Quảng Nam Province. As planned, the province plans to expand the protection area for the langurs from 10ha to 80ha, and begin reforestation of the primary forest to make a better habitat for the species. Experts from the Frankfurt Zoological Society’s Việt Nam Primate Conservation Programme and GreenViet will conduct a survey on the existence of the langurs to allocate a special protection zone for prolonged conservation. Experts from Frankfurt Zoological Society said around 1,000 gray-shanked doucs were recorded living in five provinces, including Quảng Nam, Quảng Ngãi, Bình Định, Kon Tum and Gia Lai.